to rattle the cage of anyone that think they can try it on and get away with it. If you are an honest angler, catching specimen fish and are weighing them accurately then my comments should not in any way have offended you. Well September is finally with us and do I see a slight change in the weather? Fished a river for the first time this season and my god, do we need some rain as the river Thames was almost stagnant! I have to admit, although the fishing was tough I really enjoyed the company, change of scenery and the occasional roach to just over the pound and certainly look forward to getting out on flowing water more in the next few weeks. Badshot Lea Big Pond proved that we are still a long way from getting away from the inconsistent fishing as although conditions looked brilliant for my customer, come 10am and after catching plenty of bream the lake switched off. We tried everything to buy a bite but come 3pm, and apart from what probably was a lost grass carp, we threw in the towel. It just goes to show you that knowing and being there when the fish are feeding is the difference between a good day and a bad one. With the humid weather continuing I just had to revisit the eel lake for a couple more times with my mate Chris. The first session was a real head banger as I had at least seven runs where line was pouring off the spool but failed to connect with any. The first take on worms saw a big fish hit the surface as I struck. It reminded me of Jeremy Wade striking a Tarpon whilst in a boat at night that came out of the water to the side of him, very strange but I have had eels come out of the water on the strike before so assume I was close but no cigar! The runs came on both fish heads and worms which tells us these eels are more predatory and are more than likely going to have wide, big mouths. What was also strange was that Chris fishing identical no more than twenty yards to my left never had one pick up which made us think that my runs were coming from maybe the same eel. Whilst we were there we could hear what we thought were mopeds in the distance, however well away from any roads it soon became apparent what this was as a European wasp was attracted by my head touch. Knowing how aggressive these can be and realising they were very dozy we sat for the next couple of hours in fear of being bitten and when Chris decided to tread on one that landed close to him, and knowing they put out a distress signal I felt it was time to leave. The second night was far less eventful as I failed to get a positive pick up on bolt rig worms (trying everything now) whilst Chris received four screamers, finally connecting with one, however we were somewhat disappointed as we were both expecting a whopper not a s*****r to show. Time to leave the eels alone this year but we will be back next spring. My next trip was back to Enton/Johnson’s, this time with my dad and girlfriend’s dad. Conditions looked relatively good yet with few fish moving on arrival (always a bad sign here) we knew it would be tough. I used the Pellet Cone and managed three modest tench alone with losing one whilst both dad’s failed to catch which seemed the trend around the lake as I only knew of one other tench being caught, tough or what! The fun really started when on packing up I heard Mick let out a cry and on turning saw my father, who’s 84 and just recovering from a knee operation, in mid air and lake bound! He had to do this next to the dam in the deepest part of the lake, however with the help of another angler we managed to drag him out with just the odd cut, bruised and nettle sting (plus a cracked rib which was later discovered). I’m not sure who was more shocked dad or the passengers on the train passing as anyone looking would have been confronted with a naked man revealing all. Not the prettiest sight! It was good to catch up with my mate, Tom Aldous this month, however I gave him the choice of venue and species and he suggested the river Loddon and barbel. Now with the weather set to be wet all day I didn’t relish roving around so decided to sit in a pool and keep dry yet after two hours of little activity decided to get wet and go find a fish or two. 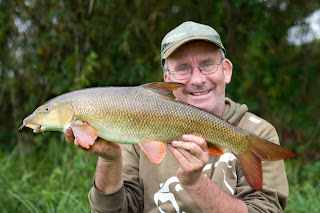 Not long after settling in a swim it seemed my run of catching not a lot was going to continue as the three foot twitch came yet the hook pulled on what felt a big barbel. Gutted I continued and soon, in another swim saw a repeat performance happening, yet this time a spirited seven pounder graced my net. Readers will remember last year me writing about the litter on the banks of a certain stretch of the river Loddon and that the angler (he can’t be classified as an angler) who leaves certain revealing items about his identity on the banks. Well the Benson and Hedges smoking, coke drinking and luncheon meat user is back as he had once again decided to chuck all his crap in the bushes! I just wish the bailiffs were more active as it wouldn’t take long to single this person out and ban him for life, well that’s if he’s a member? 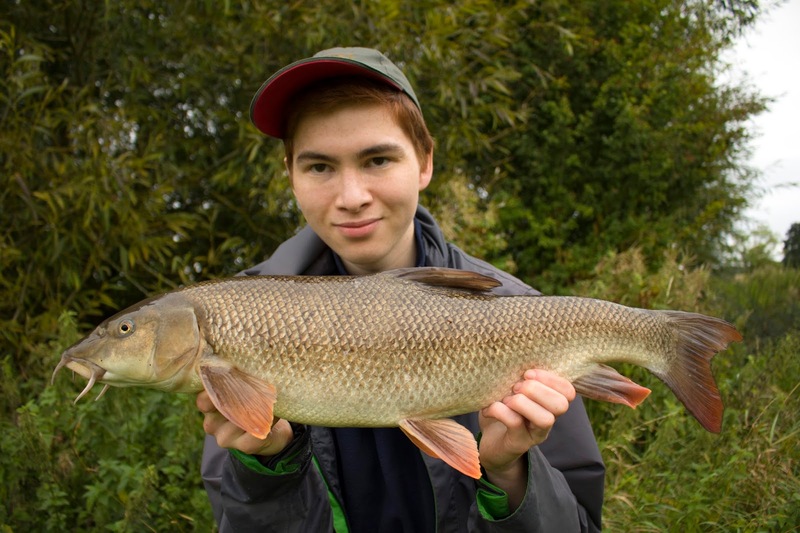 Tom’s a good learner and returned a few days later and bagged himself his first ever Loddon barbel. Let the flood gates open. Last month I mentioned how the rudd at Frensham and the crucians at Enton had disappeared and thought that they were either full up or eating naturals. Well the crucians have reappeared at Enton and they certainly have been feeding over the summer, obviously on naturals as the high two’s are now three’s and the odd one is even breaking the 4lb barrier. In all honesty if I had looked at the weather forecast on Thursday 22nd then I would have never set the alarm for Friday morning but I felt the need just to go fishing by myself. On arrival at Enton I found the lake still and covered in mist and with the temperature at only 6 degrees, a clear sky and no wind forecasted along with few fish showing knew I was there just for the love of fishing. However there is a saying that ‘all the time you have a bait in the water, you have a chance’ and that was certainly the case as after a blank two hours the fish for some unknown reason switched on and rewarded me with nine crucians to 3lb 14oz plus two carp and a tench. It just goes to show that we know little about when fish feed and although we can predict things quite accurately it’s always worth going, even if you think it’s not! 01/09/16 – Headed to the river Thames early afternoon to produce an OTB feature for Anglers Mail. 02/09/16 – Guiding day at Badshot Lea in the hope that the bream are feeding. Arrived at 6.30am and come 10am all looked good for a proper bagging session yet come 10am the lake switched off. John caught nine quality bream and a tench up till then but lost just one fish in the next five hours, still 50lb of bream can’t be argued with. 03/09/16 & 04/09/16 – Spent most of the weekend writing AM articles. 05/09/16 – Headed to the newly found eel lake with a slightly better approach. Cast out at 8pm and twenty minutes missed a screamer. This continued into the evening with both my deadbait and worm rods going, however seven bites came and all were missed! Chris sat next to me and had absolutely no pucks ups which makes us think we have few eels in the lake. The ones that are there are predatory big mouth ones as they picked up both fish and worms and that my bites probably came from the same one or two eels. We also think these eels are something special. Let’s see how they handle a bolt rig next week! 06/09/16 – At long last a day out with my and the girlfriends dad. Meeting at around 7am we headed to the railway bank at Enton, however with few fish moving we knew it would be tough. I managed three tench plus one lost come 2pm which as far as I knew was top-rod for the day as most others failed to catch. Failing to catch on rod and line. Dad even tried to get in with them at one stage! 08/09/16 – Headed to Oxfordshire at first light, this time to meet up with my good friend Jake Lund who was fishing Christchurch Lake on the Linch Hill Complex to get a few images for an Anglers Mail feature. 09/09/16 – Another attempt to get an AM feature in the bag, however with a really strong wind and bright conditions it seemed from the start that we were on a looser, so moved to a slightly more sheltered area where we struggled for a few roach. 10/09/16 – After picking Tom up from Winchester we headed to the river Loddon in hope of a barbel. The weather was terrible but our persistence paid off with myself taking one which was around 7lb. It could have been so much better but a rare hook pull on what felt like a big fish was quite gutting. 12/09/16 – The hopes of a monster eel were dashed when Chris connected with a two-pound bootlace, yet at least he put a hook in one which was more than I’ve done! 13/09/16 – After a few hours in the office headed to Richmond to create an AM feature. If you like stick float fishing then keep an eye out for this one. 14/09/16 – Spent the day in the office completing a couple of AM articles. 15/09/16 – It’s going to be a long day as after no sleep due to the noisy storm last night found myself on the road come 5am heading to the river Wye near Hereford. It wasn’t the best of journeys but I finally found myself with a nice mug of coffee in my hand made by Sue at Sink Green Farm where I met up with good friend Mark Grafham and my customer for the day who was treated by his girlfriend to one of my vouchers last Christmas. If the other half is finding it difficult to know what to buy you for Christmas then why not get them to buy you ‘A day with Duncan’ voucher? Fortunately Mark had done some research earlier in the week and directed us to a couple of producing swims where we caught steadily all day on both the feeder and float which what Matt really wanted to do. The barbel were all sizes from a pleasing 12oz right up to a proper one weighing 9lb 10oz for Matt along with the odd decent chub. Anyone wanting to try this fantastic river then get in touch as I am going to be spending some time there next year and can work out a price and organise B&B if needed. Come 10pm I found myself pulling into the driveway, totally knackered but very pleased with how the day turned out. 19/09/16 – 22/09/16 – Spent a few days away with my brother and dad at Coghurst Hall Holiday Park near Battle in East Sussex. My brother managed to catch some sizable mackerel of the pier which we enjoyed for breakfast whilst my dad and I fished the sites lake which apart from a few skimmers and a big eel that I lost at the net on a white boilie proved somewhat difficult. The following day we fished the Old Specimen Lake at Wylands and enjoyed all sitting in a line catching carp to high doubles. We were supposed to leave Friday morning but dad had a pain under his right arm so needed to get it checked out with the doctor who seems to think that whilst falling into Enton he cracked a rib! 23/09/16 – Having the best part of the day to myself I headed to Enton, however after two hours looked as if I was starring a blank in the face. Then things started to happen and in the next three hours landed nine crucian to 3lb 14oz, two small carp and a tench before reluctantly having to head home to sort some financial things out. there as I felt he had a very good chance of beating his 3lb 12oz best. Dropping into a couple of favoured swims things weren’t looking that good as after a few hours all we had to show for our efforts were one 3lb 3oz crucian, a small tench and a rudd between us, but then Chris received a screamer that he initially thought was a tench. That tench finally turned into a crucian weighing exactly 4lb, a known fish that Paul Garner caught a couple of times a few years back. Happy days and I love it when a plan comes together. 28/09/16 – Headed to the river Loddon with Tom to try and create a barbel video. Arriving at 1pm in fairly bright conditions and finding the river low and clear it was always going to be a struggle but I wanted to prove that if you adopt the right approach then you should be able to buy a bite or two and that’s exactly what we did. Unfortunately the size of the barbel and chub wasn’t anything to set the world on fire but I took satisfaction knowing that if I can catch the smallest barbel in the river then I can certainly catch the biggest, all I need to do is continue getting bites, which isn’t proving difficult of late. I'm just testing the water after returning from a successful days guiding on the river Wye which saw two anglers share a catch of around twenty barbel to 9lb 10oz alternating between the feeder and the float. I am also looking at spending three days on the river in Aug/Sept and Oct next season and the cost based on two anglers per day will be £125 per angler. As from this month I’m going to try my best to write up this introduction on a daily basis as I seem to miss so much trying to remember things come the end of the month. angler in AT this week who states that he’s just found the new wonder rig at Godalming Angling Club’s Harris Lake. I’m not sure where this angler has been for the last two or three years as the widely used Pellet Cone has almost had its day, well it has with me because I’m on something else now that’s far more effective! Anyway it made me laugh as it probably has numerous others as we all know that the angler in question is far from the first, in fact he’s probably the last! My next moan is regarding waders, not for the first time! I have to admit that there are lots on the market that state, they won’t let you down, however I have spoken to numerous anglers that have tried numerous manufacturers and to be honest, the slogan should be 'they will let you down!' I’ve just thrown my second pair of Greys GRXi in the dustbin. When I first purchased these I thought that spending that little bit more would give me a product that would last a lifetime, however on buying these I was in no way made aware that I would have to continuously treat with a waterproofing agent. Six months into using these they started to leak, not badly just a damp feeling that slowly got worse. Returning the product Greys were kind enough to supply a new pair but again they leaked soon after purchasing and only after looking into the product and questioning them was I then told about the problem. Would I have purchased these if I was made aware of the problem, no. However if they had been sold with a tube of waterproofing treatment, something that would have little if anything to the cost, then I probably would have. Looking at their website they now have discontinued these and offer just two styles, CT waders and CTX waders that seem to be far more expensive than the GRXi; however nowhere in the description does this state that they need to be treated! I just hope, and I would like to have some feedback if possible, in knowing that the product has been improved so that customer forking out a lot of money won’t be disappointed. In the meantime I’m sticking with Vass waders, yes your bum will look big in them, you won’t win any fashion shows and yes they aren’t QUITE as comfortable as the Greys but one thing is for sure, they cost far less and will last you a lifetime! Moving on, a customer asked whilst bending into another tench at Frensham one weekend, why don’t you fish on weekends more. The answer was obvious as we were fishing a new swim for the first time this season, too many anglers, too many dog walkers, just too much noise and distractions. Soon after he left I decided to stay on for an hour and dry the nets and sling off. With rods out on sticks in the water I decided it was time for a snack, yet halfway through my sausage rolls I had a bite and soon found myself out in the water playing a tench. I was then confronted with some disturbance behind only to turn and see a dog with its head in my sausage roll bag and then departing with on in its mouth. Why don’t I fish on weekends, you now know! Working as a freelance photo-journalist for Anglers Mail I’m fortunate to meet up with all sorts of anglers as well as meeting them on different venues and this month was no difference, however the highlight was spending a night eel fishing with my good friend Fred Healey. The fishing wasn’t that good, just one screamer that I missed (Fred fared somewhat better); yet just putting the angling world to rights was enough to make the long journey to the East Sussex coastline worthwhile. I also had a trip down to Swanage to meet up with an angling mate who wanted to show the amount of different species that can be caught of the pier in just a few hours. It a great way to get the whole family into fishing so keep an eye out for this over the next few months and next time you head to the seaside pack a couple of rods as you will be surprised what can be caught on tiny lures. Welcome to autumn, yes the summer is now officially over and with the days drawing in and the nights not just getting cooler but damper as well there is a real feel that better fishing is just around the corner. In all honesty I think next year I will give fishing a miss in August as it’s that horrid end of summer month when the fishing can only be described as appalling. This year has been probably one of the worst ever, probably due to the weather, hot and humid most of the time and as for the wind it’s been almost non-existent. When the wind has blown it’s not been for any prolonged period and has often changed direction on a daily basis and the old saying ‘if the wind can’t make its mind up, the fish cant either’ has certainly rung true. Probably the best example of just how bad the fishing can be in August was a trip to Mill Farm Fishery in Sussex. I had a customer with me who wanted to catch a silver bream. Now over the years I have spent loads of time fishing this venue and seen the complex take a turn for the worst regarding the silver bream. Going back maybe five years you were able to fish a maggot/worm cocktail for the silver bream on the Specimen Lake and if you caught one the chances would be it was a two, now you have to fish pellets, sometimes 8mm pellets just to get through the small fish and play a numbers game with the carp, however even on such a prolific venue, the month of august showed just how bad things can get. I would have happily bet my house on my customer catching a silver however as hard as we both tried it just didn’t fish. In the best part of eight hours all we caught were five carp, a tench and one small roach. At first we just put it down to the weather, humid and still yet after a few hours the problem became noticeable as there was a massive algae bloom which turned parts of the lake almost black! I just hope they get some water pumping through the venue as it could be disastrous if this weather continues. Another disappearing act have been the crucians at Enton along with the rudd at Frensham. Again I don’t know the complete answer, algae could be partly to blame yet this month is when the natural food larder is at its fullest and these fish either have had a really good feed already or have simply switched onto this rich harvest and in doing so turned away from our baits. The weather forecasters are also bloody rubbish as just this weekend (27th/28th) they said that Sunday would be better than Saturday. Now I’ve become somewhat wise to these sorts of statements as Saturday was a reasonable day with plenty of sunshine and no rain. Making the most of this I did quite allot in the garden which was fortunate as come Sunday it rained nearly all day resulting in the food at the family BBQ being cooked in the oven. With technology nowadays you would have thought that they could be slightly more accurate, yet fearing a repeat performance of Michael Fish’s forecast some years ago they do seem to edge on the side of caution! One last note is I’ve had my fair share of big rudd from Frensham over the years but this season can’t seem to get over 2lb 12oz, which is good as it is an increase from previous summers. I have also seen that quite a few of the fish being caught are recaptures which indicates that either the amount of big rudd is far less than I first thought or I’m just attracting the same shoal into my swims. I have actually started looking at each fish in more detail and making a data base as it seems that some anglers average weights seems to be slightly higher than mine which is concerning as most are using the same tactics I first started using many years ago and are fishing the same areas. Now I’m not saying that all the rudd anglers at Frensham are liars (well one angler that started he had caught a dozen three’s in a session is a liar as I’ve only caught two in 33 years of fishing the venue), most are as honest as the day is long, but I do know of the odd angler that is either dishonest, doesn’t know how to weight fish accurately or has a set of magic scales and has on more than one occasion in the last couple of seasons pulled the wool over the weekly magazines eyes with very distinctive fish caught on other waters I know inside out! If it continues then maybe, just maybe I will have to step in and make a stand as it’s so unfair for all the honest anglers that put so much time in and then are only kicked in the balls by such bad practices. 01/08/16 – Can’t believe it, after such a dry spell the rains once again is on its way, typical as this evening I’m off to the river Loddon to help six anglers try and catch a barbel. Although the evening was enjoyable the weather did make it a little uncomfortable and with the river running gin clear the fish certainly weren’t crawling up the angler’s rods which they probably would have been if the event was Tuesday morning! Back at home around 10.45pm I then had to sort some final bits out for a guiding day at Frensham the following morning. 02/08/16 – The alarms sounded at 4am, and come 5.30am I was on the banks of Frensham Great Pond with my customer. Fortunately the venue has been fishing badly all season and with no other anglers fishing dropped into one of my favourite swims. First job was to bait up and the second job was for my customer to start bagging up on tench, which he duly done with eleven red eyed beauties to 6lb 12oz which as a new personal best by 3pm. 03/08/16 – Another relatively early morning, this time 5.30am as I was meeting my good friend Paul Garner to help take some photos for him at BLBP. Amazingly once again the venue was relatively angler free and come noon I was walking through the front door after watching Paul land well over 100lb of fish. If you are interested in’ what he caught then keep your eyes peeled over the next few months in IYCF. 04/08/16 – Another early start this time due to meeting Alan Blair at the new Nash lakes just outside Royston in Cambridgeshire. Arriving at 7.30am it was great to spend a few hours interviewing him for a soon to be released Carp Crew Guest appearance in Anglers Mail and to be back home in double quick time, 1pm. This allowed for a couple of hours shut-eye before starting to get the tackle ready for a day’s guiding on Sunday plus backing up images and getting the camera equipment organised for a photo-shoot at Hollybush Lakes on Friday morning. 05/08/16 – At last a lay-in, well 6.45am and a breakfast at last, before heading to Hollybush to meet up with my good friend Jake Lund to create some images for his next technical Carp Crew piece in Anglers Mail. Keep an eye out for this one as first session on a new lake and he catches a whacker! Back at home it was straight into the office to start writing up the words for all the articles. 07/08/16 – I don’t normally fish or guide anglers on a weekend, however things have changed and although I can’t fish every weekend I can get out from time to time. Today was one of those rare occasions and another early morning as I was on the banks of Frensham Great pond before 6am to meet Adrian and Harry who was in need of a quick-fire introduction to the venue. The lake was strangely busy so after some thinking we dropped into a swim rarely fished. Out went the bait and in came the fish, around a dozen tench, the best setting a new personal best to Harry at 7lbs 3oz before we packed up at 1pm. Words received from Harry – “Thanks for the photos – they’re great, and a big thanks too for the trip. I’d a great time, learnt a lot, and was thrilled to beat Ade’s personal best, alongside my own. I’m itching to get back to Frensham to have another crack, and reckon I and Ade may have a fair bit more success in the future thanks to your great techniques and advice. Hopefully see you again at Frensham sometime, maybe to show you a few tricks of my own, Harry”. 08/08/16 & 09/08/16 – The last couple of days have been quite relaxing and rewarding as Monday was started with 9 holes of golf with my mum, followed by helping my dad out with car problems before finding myself on my knees weeding for my mum. Things then got back to normal as I found myself in the office waiting for numerous articles to come in and in waiting sorted some long awaited paperwork duties. 10/08/16 – Up early again, 5.30am and after dropping the girlfriend at work headed to Badshot Lea Big Pond to meet my dad and girlfriend’s dad. Unfortunately twenty anglers were already camped around the pond so my tactics of casting a massive method feeder into the middle of the lake, probably wouldn’t have gone down to well so I decided to give the fishing a miss and catch up with the dads. Back at home it was a case of getting the eel kit sorted before the long drive to an East Sussex coastal destination to meet up with my good friend Fred Healy. The visit was to create an Anglers Mail OTB feature which we successfully secured. Keep an eye out for this in AM soon. 11/08/16 – After a restless night under the stars in hope of a monster eel I quickly completed the photographs with red Healey before hitting the road at 9am. Three hours later I was pulling up in the drive, completely shattered and in need of a few hours’ kip. 12/08/16 – A morning spent in the office completing Fred’s feature along with a few Carp Crew pieces also for AM, before heading to Frensham once again for an evening guiding Lewis in hope of a big rudd or two. Unfortunately the small rudd at Frensham are making catching a specimen difficult and apart from one decent fish that fell off the night past quietly. Chris who had joined us managed one rudd which was a repeat of a fish I caught a few weeks ago which proved the same shoal was in front of us. This fish weighed 2lb 7oz and showed three distinct dark scales on one side. 15/08/16 – Up early and at Frensham come 5am; however I’m not expecting too much for Neal and Neil as the temperatures are forecasted to rise to the high twenties by lunch and there’s a horrid easterly wind blowing. Fortunately half a dozen tench did come their way and the two anglers learned loads, so all in all a productive guiding session. 17/08/16 – A morning in the office before heading to Winchester to team up with my friend Tom Aldous so we could get some images for an Anglers Mail Lure Attacks feature. 18/08/16 – The high pressure is still with us so I decided that as I was to guide two anglers for barbel on the river Loddon that we should start late and finish late, so come 1pm we were heading to the river in hope of a fish or two. It became an eventful session as late afternoon Mark hooked his first ever barbel, not a massive one, but one that decided to snag him in some weeds. Knowing it was his first ever I decided to take one for the team and jump into the river so it could be freed and landed. Later that evening, when it was completely dark and after Mark had landed a modest chub he found himself in a bit of difficulty as on hooking a decent chub he had somehow lost grip of his landing net that had headed down stream under a copse of trees. I was upstream with my other customer so had to head downstream, land the chub, which was a personal best at 5lb 8oz, before once again stripping off and heading under the trees, in the dark, to retrieve his net. Later that evening my other customer, also Mark managed to catch a modest chub along with missing a few chances. The naked guide is back on the scene! 19/08/16 – Today was supposed to be a day producing an article for the Nash E-Zine magazine but Colin has more than enough material for the next issue so I decided to meet up with my dad and have a fish, the first time we have done this in months. Chris joined us and we headed to Enton in the hope of a crucian or two. The weather looked and felt spot-on but strangely the fish had other ideas and we found really hard going. Chris managed three tench and a common, whilst myself and dad fished together using one rod each. I had a rudd and two tench whilst dad showed me how it was done with six tench, two crucians and a rudd. Now you know why I don’t take him that often! 21/08/16 – Spent the day in the office writing up a couple of AM features. 22/08/16 – After another day proof reading an AM article I headed back to Enton, in far from ideal conditions, as I wanted to try a swim I’d never fished before to see if the disappearing crucians were piled up in front of it. Unfortunately they weren’t and after a few good tench, one approaching 7lb I decided to pick Chris up and head south to find an eel water that a friend had put me onto which we hope to try out next week. 23/08/16 – Took me mum for a round of golf in the morning before sorting out the barbel tackle as tonight is the last FAS Barbel Teach-in of the year. Arriving at 5pm it was obvious that some anglers were either going to be late or not make it as the roads around Reading were just jammed up. The conditions, bright blue skies and humid, weren’t great, yet two barbel, the best maybe 10lb were landed along with another one lost, so all in all a productive evening. 24/08/16 – Spent the morning in the office, early afternoon sorting rudd kit before heading back to Frensham in hope of a few big rudd. 26/08/16 – We were the first into Mill Farm Fishery when the venues automatic gates opened at 6am, our target silver bream on the specimen lake. Much of August has seen little wind, high pressure and soaring humid temperatures and today was no exception. It wasn’t long after casting out that I knew there was a problem as two hours in neither myself or Neil had managed to get a response. The problem did show itself later as an algae bloom erupted in front of our eyes and having caught just a few carp, one tench and a single roach we decided it was not worth fishing, headed home to beat the Friday rush hour and promised to return in a month or so. 29/08/16 – Spent the day answering A&Q for Anglers Mail. 30/08/16 – After a tip off from a friend regarding a venue with some big eels and after locating it the previous week myself and Chris decided on giving it a go for a few hours. To be honest the kit, or should I say bite indication system weren’t the best as we had both agreed just getting a bite would be a result. As darkness fell we were just saying what the bites would be like, as the lake is really shallow, when one of my bobbins smacked against the rod blank dragging the rod forward. Unfortunately the fish dropped the bait, just as I struck and we were left almost speechless. Chris decided to slacken his baitrunners right off however any resistance isn’t good when eel fishing and the next two runs, although taking line from the reel for a split second, again came to nothing. Two more half chances came, but no eels were banked and come 11pm we headed home happy with our finding and planning next week’s return. 31/08/16 – A day spent in Swanage compiling an Anglers Mail Lure Attacks feature.